Prosecco, a sparkling Italian wine can be the perfect selection as an excellent wine to serve with appetizers, light meals or fruity desserts. You will find the crispness refreshing and the bubbles exciting. Prosecco is a dry sparkling Italian wine that comes from the grape of the same name - a white grape grown primarily in the Veneto region of Italy, north of Treviso in the northeastern corner of Italy. The wine has a reputation for its rich aroma, crisp mouth feel and fruity overtones of yellow apple, pear and white peaches. This grape ripens late in the harvest, which tends to make it a sweeter grape. Many perceive the resulting wine as slightly sweet; however, the acid and mineral balances of the wine keep it from being extremely sweet. This medium-bodied wine tends to have large bubbles, resulting in a medium froth. Its alcohol content of 11 to 12 percent is lower than some other wines. This lower alcohol level, combined with the slight sweetness of the wine, makes this wine a popular choice for both novice and experienced wine drinkers. Vintners began making this sparkling wine as early as the 1100s, and many enjoyed the wine due to its slight effervescence. Producers crushed the grapes and fermented the wine in the bottles. This is the same process used for making Champagne . Since there was no temperature control to the fermentation, it was common for yeast cells to die due to the cold of winter before they had a chance to convert all the sugar in the wine to alcohol and carbon dioxide. By spring the wine was still slightly sweet, and any carbon dioxide bubbles were contained in the bottles, giving the wine a slight fizz. In 1868 winemaker/chemist Antonio Carpene founded the Carpene Malvolti winery. He changed the way vintners made this sparkling Italian wine by producing and fermenting the wine in large pressurized tanks. The "Charmat "style was the name given to this new wine making process. The positive reception to this wine was so overwhelming that Carpene started to teach other winemakers his process. He eventually founded the School of Viticulture and Enology at Conegliano, which to this day is one of Italy's most important wine schools. Carpene and other Prosecco producers made a relatively sweet wine and used a full secondary fermentation to achieve a wine with a lot of fizz. This type of wine, called "Spumante," is still in production today. In the 1960s, vintners introduced a lighter, less expensive sparkling wine called a "Frizzante" or "Gentile." Today this wine is available with both levels of carbonation. 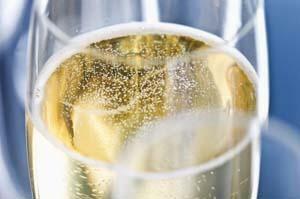 There are now about 5,000 producers of Prosecco in the Veneto area. The better wine is from the DOC Prosecco di Conegliano-Valdobbiadene, founded in 1969. The Prosecco produced in this region must be made from at least 85 percent Prosecco grapes with the remaining 15 percent being Pinot Bianco, Pinot Grigio, and Chardonnay or up to 10 percent of Verdiso. Conegliano - This is a lower lying area that produces a fruitier wine. The aroma and taste tends to lean more towards the peach notes and away from the citrus aromas and tastes. Valdobbiadene - This is an area of higher elevations. It produces a crisper, more citrus-tasting wine. As with all wine varietals, not everyone likes the same type of taste profile - some prefer a sweeter wine, some prefer a wine with more bubbles, etc. To select the perfect bottle for your tastes, you need to find the balance of sweetness and acidity that you prefer. The selections with the lowest amount of residual sugars are labeled "Brut" and are the least sweet. If you want slightly more sweetness, then you should try a bottle labeled "Extra Dry". If you are looking for a sweeter wine, look for "Dry" on the label. Prosecco does not get any better with age, so you can't assume (as you would with a red wine) that the wine will mature and take on more favorable characteristics. You need to find a selection you like today and enjoy it within the next few months. Many bottles bear the NV (non-vintage) designation, which can be an excellent selection. This is a wonderful wine to keep chilled in the refrigerator so that you can pull it out at a moment's notice and serve it at its preferred 45 to 46 degree serving temperature. Pour this light golden sparkling wine into tall flute-shaped glasses to preserve its sparkle. It is an excellent way to make a few simple snacks feel like an appetizer party, and to help a bowl of fresh fruit become a dessert extravaganza.